GSI employs a variety of different mixing and pumping configurations to match many of the remediation chemicals used for site remediation. Pumping systems include rotary diaphragm, pneumatic diaphragm, and piston pumps. Multiple mixing and pumping configurations allow us the flexibility to pump many different products into varying subsurface conditions, all while keeping costs down. We have experience pumping many chemicals including permanganates, persulfates, oxygen releasers, emulsified oils, and zero valent iron. We are experienced with products manufactured by Regenesis, FMC Corporation, Adventus, and others. GSI has completed jobs ranging from low volume injections into only a few holes in one day, to thousands of gallons over approximately 100 holes. 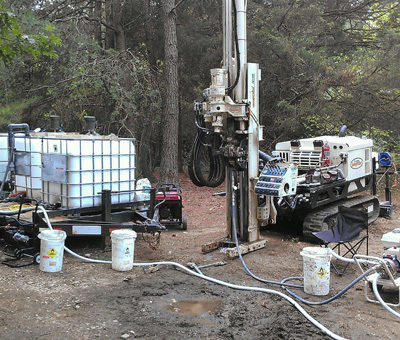 Our injections have been successful to depths exceeding 100' below ground surface. The GSI preferred method is direct injection through probe rods, since this allows increased flexibility in response to problems arising from short circuiting, daylighting, and the inability of the formation to accept the required quantities of the injection material. GSI can also inject some remediation chemicals through permanently installed injection wells or install injection wells for consultants and contractors who wish to complete the pumping themselves. Our experience makes us an asset during the planning phase of any injection work.